For our birthdays this past year, M and I decided it was time to buy each other a grill. 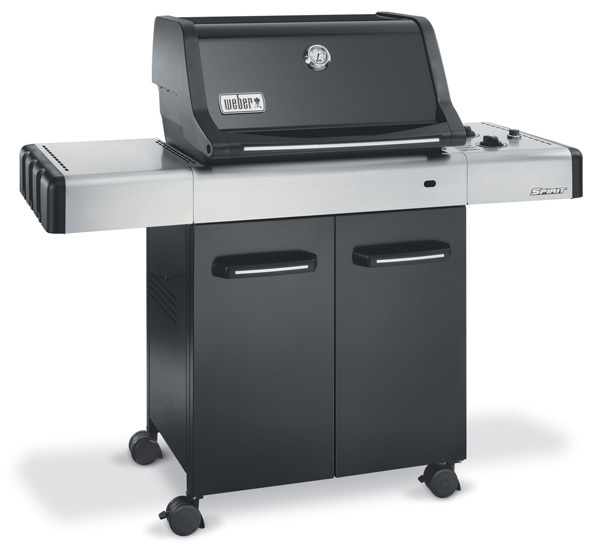 Not just any grill…a Weber Spirit E-310. 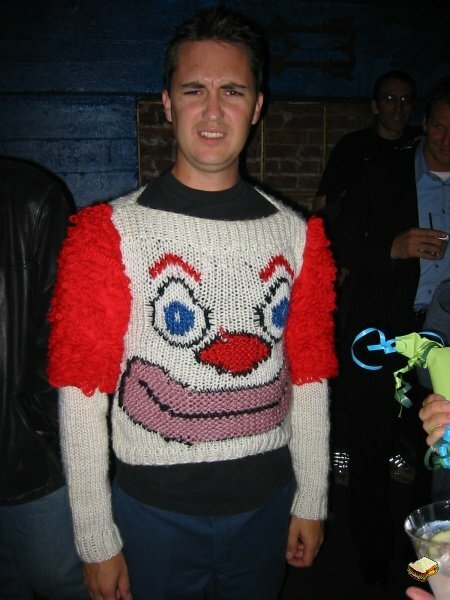 We’ve named him Whil Wheber to honor Wil Wheaton of Star Trek fame via Family Guy (first runner up went to Gril Weber). Yes, it’s a little nerdy. What’s NOT nerdy is how awesome M is at grilling stuff. 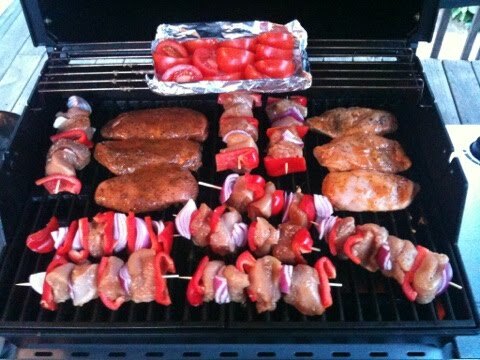 Most of the meals that we cook at home now involve the grill in one capacity or another. We love having people over for BBQs (recently mostly indoors because of the terrible New England Weather) to share the grill wealth. 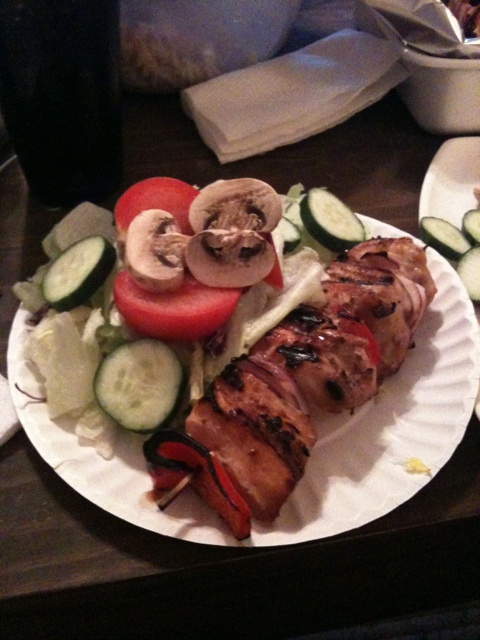 Last night, we had the most de-li-cious grilled chicken kabobs that I’ve ever had– and that’s saying a lot as considering I am somewhat of a chicken kabob connoisseur. 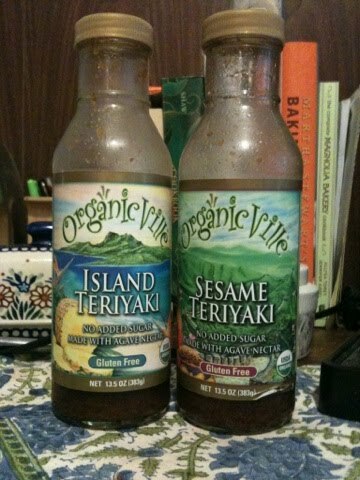 M marinated the chicken over the weekend using Organicville Island Teriyaki and Sesame Teriyaki marinades. These sauces are amazing! Not only do they taste great, they are also gluten free, and made with agave nectar. 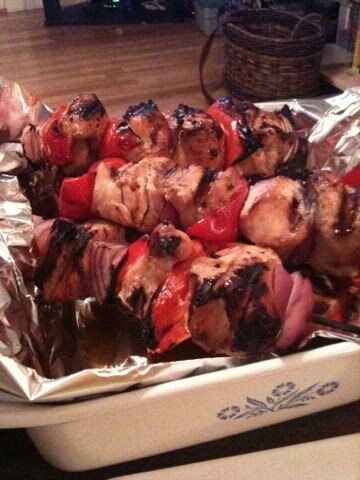 We also tossed on some tomatoes and some Cajun Chicken. Plenty of food for dinner, lunch and another dinner. 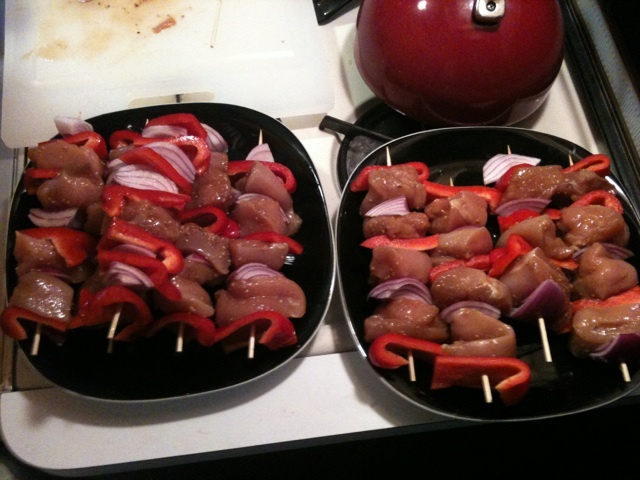 These were, by far, the best chicken kabobs I’ve ever had…and we made them at home, which makes me really happy! Have you ever noticed that when you cook a really great meal at home, you feel one thousand times happier than when you get a great meal at a restaurant? M and I have been trying to cook at home a lot recently, and, if I do say so, our creations have been phenomenal. We feel more nourished and like we’ve accomplished something after we cook a nice dinner. Yay for Whil Wheber! He makes us delicious food and saves us money! these look delish! so simple, but much more fin than boring grilled chicken!